NuHaven Apartments is situated in the heart of the ‘Mirrabooka Town Centre Structure Plan’, 14 kms North/East of the Perth CBD and similar distances to both the Domestic Airport and the North Beach. It is an important service area of the Northern Central Corridor and has been identified for massive redevelopment under the West Australian Planning Commission’s State Policy; as such the City Of Stirling has developed the “Mirrabooka Town Centre Structure Plan” The Plan is intended to guide land use and development of public and private land in the area to achieve a vision of creating a safe and attractive town centre which offers a diverse range of uses, while servicing the shopping and service needs of the catchment area (Mirrabooka, Balga, Dianella, Nollamara and Westminster). As such, the City of Stirling initiated a redevelopment initiative that has culminated in the preparation of a structure plan and a detailed area plan to guide the redevelopment process. The intent of the updated planning framework is to encourage the transformation of the precinct into a vibrant and desirable hub. 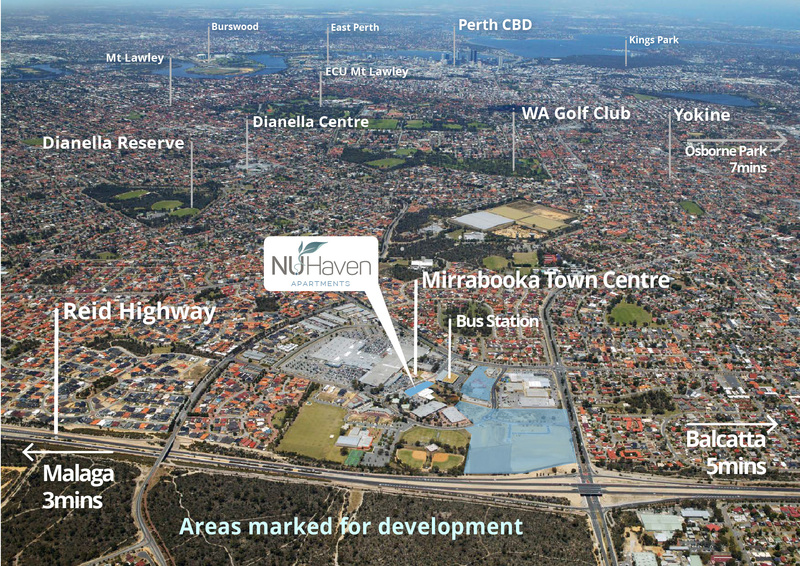 As a component of the Mirrabooka Town Centre, NuHaven is situated directly opposite the regional bus station and the Mirrabooka Square Shopping Centre. A short stroll away from the Mirrabooka Recreation Centre, City Library, parkland and a broad range of commercial and shopping facilities. The Mirrabooka Town Centre is identified as the major destination of the proposed express transport system that will provide high-frequency public transport services to the Perth CBD, and ultimately to UWA and Curtin University. Private sector developers have already identified the potential of the area. Perihelion Health, a significant health campus, MYVISTA, an aged care facility and international college; are earmarked for development within minutes of NuHaven. These three developments are expected to provide ˜1,000 jobs in the area.